Undergoing dental cleanings at Dr. Jon Marc Van Slate's Houston, TX, practice every six months can provide a foundation for a lifetime of healthy, beautiful smiles. In addition to using advanced technology to remove plaque and treat periodontal disease, we will also screen for symptoms of oral cancer, temporomandibular joint (TMJ) disorder, and sleep apnea. To schedule your routine examination and cleaning, reach out to our practice today. When you arrive for a cleaning, your dental hygienist will first examine your teeth and gums to look for of decay. Next, he or she will carefully remove bacteria from the surface of teeth. If you have suffered cavity, we will likely recommend that you undergo a dental filling procedure. In order to help protect the overall health of our patients, we will screen for multiple concerns during your examination. 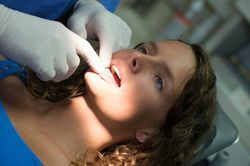 We will thoroughly inspect your oral tissues to look for lesions, discolorations, and other abnormalities that may indicate the presence of oral cancer. When this potentially deadly disease is spotted in its earliest stages, the chances of a successful treatment can improve greatly. TMJs connect the lower jaw to the skull. When these joints become inflamed, patients can experience a wide range of negative symptoms, including chronic headaches, jaw pain, and a popping or clicking sound when chewing. If we diagnose you with TMJ disorder, we can provide non-surgical treatment with a custom oral appliance. These devices are specially designed to help move the jaw into proper alignment and reduce strain on TMJs. Obstructive sleep apnea (OSA), which is the most common type of sleep apnea, occurs when throat muscles relax and block airways during the night. To help screen for this condition, we will discuss your sleep habits during your examination. If we believe that you may be suffering from OSA, we will likely recommend additional testing so that we can make a professional diagnosis. Fortunately, patients with OSA can often find relief by wearing a custom oral appliance at night. Undergoing a dental cleaning every six months will allow us to remove bacteria from hard-to-reach places and help to prevent minor concerns from developing into serious problems. We recognize that healthy gums are a crucial component of oral health. In order to effectively address the early stages of gum disease, we utilize state-of-the-art periodontal technology. We can use a special laser to remove bacteria in infected periodontal pockets. The procedure involves minimal discomfort and can be completed in just minutes. AIR-FLOW® PERIO is a revolutionary tool that allows our team to air polish periodontal pockets. In just five seconds per treatment site, AIR-FLOW® PERIO can safely and painlessly eradicate a periodontal infection. If we diagnose you with a more advanced case of gum disease, we offer several other periodontal treatments to restore your oral health. Undergoing a dental cleaning every six months will allow us to remove bacteria from hard-to-reach places and help to prevent minor concerns from developing into serious problems. Patients who are at-risk for decay or gum disease should undergo more frequent cleanings. Contact our practice today to schedule a cleaning. “Honestly one of the hardest working and most thorough dentist in the city! I started seeing him because he was close to my job and will continue to come across town for his outstanding customer care and work.”	Dee O.